Look at him sacked out in the front yard. He never used to lay down during the day, but now he's an old man, snoozing away. His lips were twitching as I took this picture. Little puffy snores came whistling out of his nose. I wonder what he was dreaming? 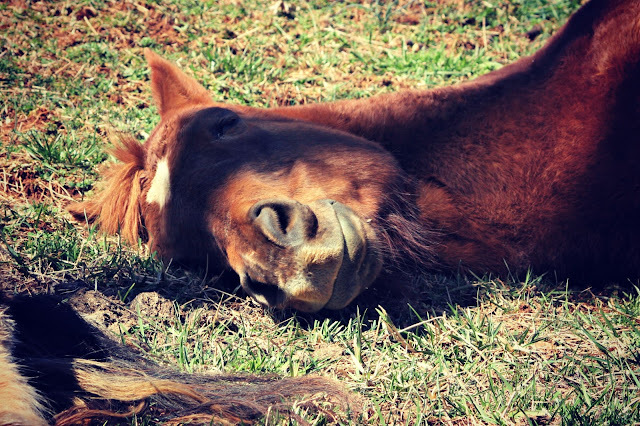 Was he dreaming of the parades I rode him in when we lived in Texas? Galloping through bluebonnets? That time a few months after I'd just gotten him when he dumped me in the gravel pits and bruised two of my ribs? Or perhaps his dreams are of more recent times, like when the neighbor's dog was chasing him in the pasture last week. Harriet says, Go on now, leave him alone! Can't you see my friend is trying to take his midday nap? Makes me want to take a midday nap today and it's barely 6AM. Naps feel better the older we get. Loved this post! I bet they enjoy not being penned in all the time. They don't go very far do they.... that must mean they like their home with you. Naps are good! I love the photos of your horses. Phoenix looks so relaxed. I can imagine he has many good memories of his years with you, as you do, too. He's a beauty! Slumbering away the afternoon looks like a great idea! Ahhh...this is the sweetest post! Time keeps moving on, gosh darn it. The good ole days. He will be enjoying some nice warm naps in the sun this spring. But won't we all. so very sweet. he's had a great life with you. Sweet and lazy--that's a good way to spend retirement! I for sure believe that a lot of animals dream!!! I have never seen a horse sleeping on it's side! Scared me for a minute. 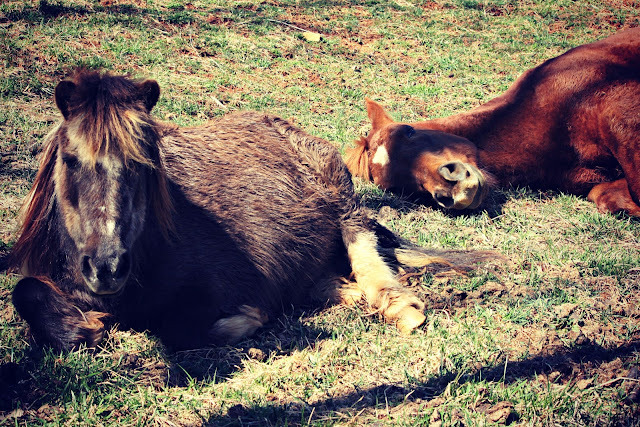 We kept our pony and mini in the yard for a couple of years... I loved seeing them like this, snoozing in the sun! Great pictures! Good memories! That is so sweet.. The horses near here were laying down sleeping.. That means the ground must be warm enough for them to lay down and enjoy the sun shining on their left sides.. He is so sweet and looks like he was thoroughly enjoying his nap. That's so sweet! A snooze in the afternoon sounds good to me. I Love this post! They are so darn cute and adorable!!! Just love those faces! Great photos! Our elder mare takes lots of naps too- kinda scary sometimes..she's a heavy sleeper. 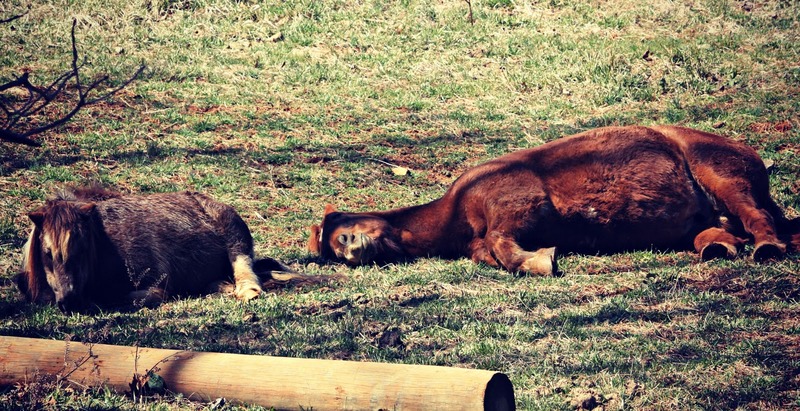 Many, many times when I have found my horses snoozing I have laid on top of them and joined them for a little nap. He looks just like my dog when he flops to the ground to go asleep. Such sweet photos-I'm glad you shared them! Oh my gosh--he looks so silly out there sleeping like that! He sure is trusting. Oh ow sweet. We should take his idea and get an afternoon nap. I bet we would all feel better. Love teh commentary. What a great scene to find. I love the photo of the horses,,, we can smell the sweetness of the grass, and can hear them breathe! So cute! I wonder what he's dreaming! :-) Thanks for visiting my Fridays fences/ Random 5 Fri post and commenting! I think he deserves a nap!